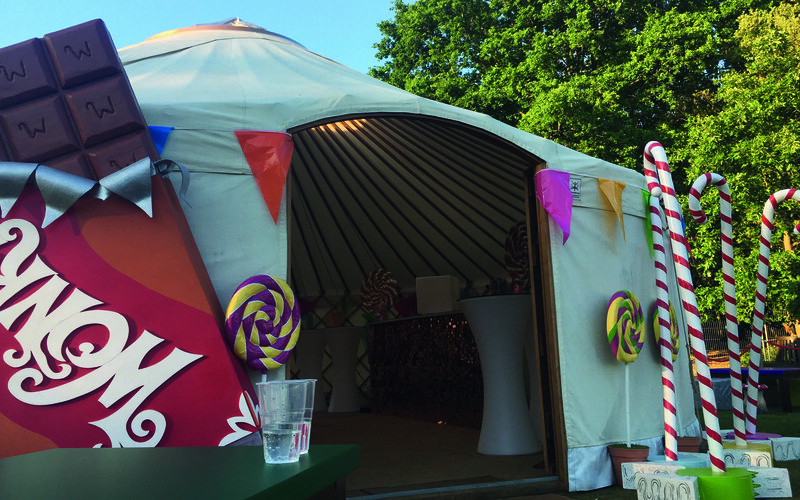 Whilst you were most likely relaxing over the unusually warm British Bank Holiday, we were busy setting up our stylish VIP area at the Roehampton University Summer Ball. 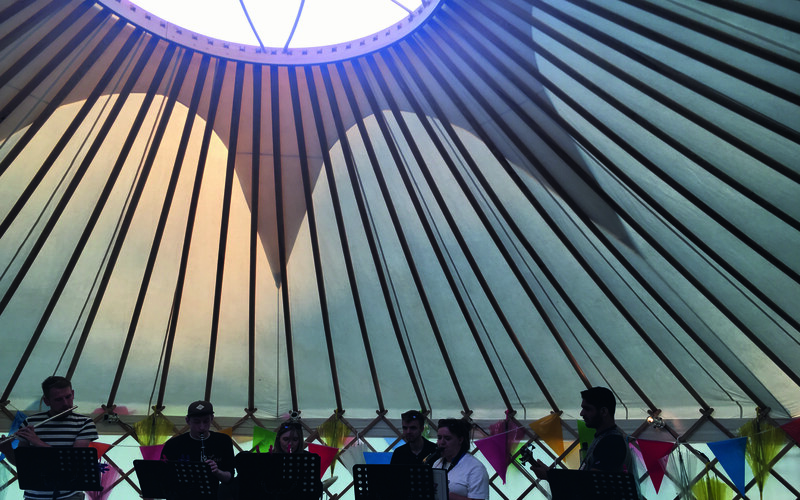 Following a meeting with the Roehampton Events team and a site visit we proposed a kaleidoscope of colour which would sit next to the main stage during their Summer Ball. 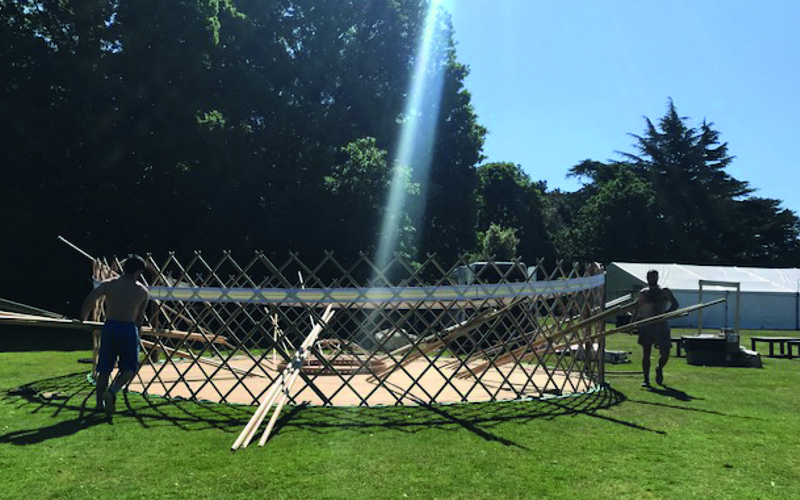 Running with the chosen summer theme of Willy Wonka and the Chocolate Factory we designed and proposed an outdoor area with a large 28′ yurt at it’s heart. 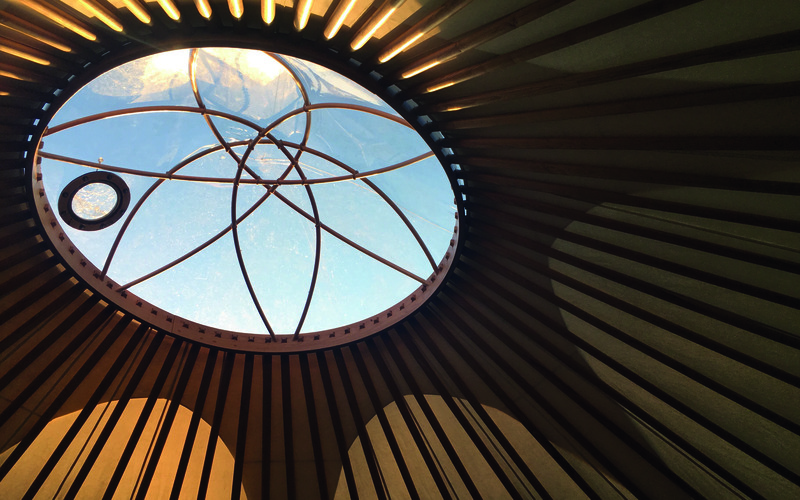 The yurt itself, with it’s impressive wooden curves and lattice work, sat majestically next to the beautiful lake. 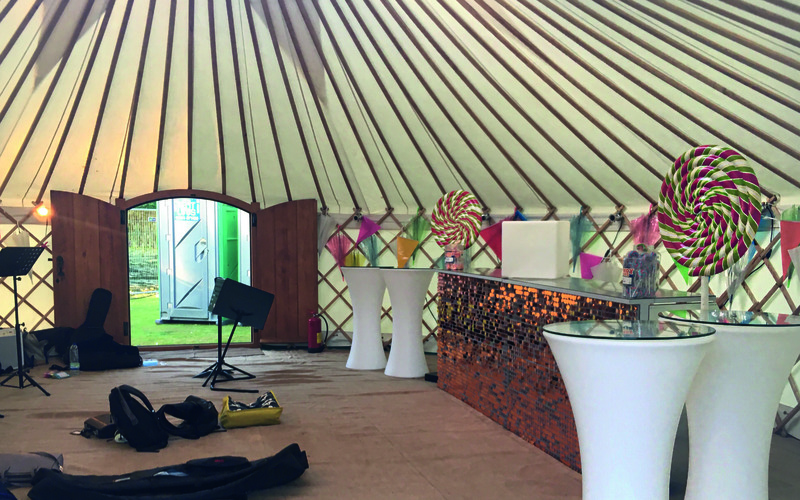 Once we decorated the outside with multi-coloured bunting the structure quickly became the centre piece of the first ever VIP area to be featured at the Roehampton Summer Ball. 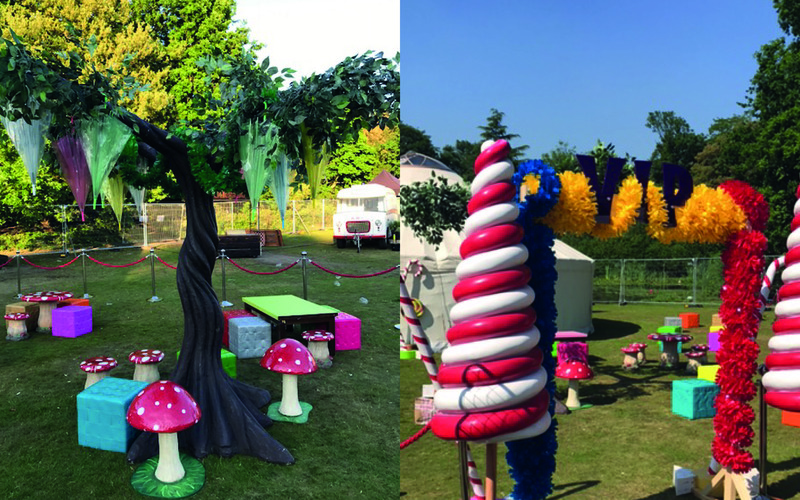 Surrounding our structure we had various multicoloured seating and brightly coloured vinyl topped tables, toadstools, giant candy canes, lollipops and even a 2.6m high enchanted tree. For the interior we dressed more bunting, installed mood lighting and created a feature shimmer wall for the two large bars. We positioned giant lollipops and various Willy Wonka themed props to carry on the theme throughout. To finish off the inside we added over sixty bright umbrellas hooked around the inside walls of the yurt- perfect in case the weather took a turn for the worse. To enter the VIP area, via security of course, you would walk through our bespoke timber VIP arch entrance surrounded by giant garlands topped with acrylic CNC cut purple letters. The area was given a red carpet feel using silver stanchion posts and ruby red ropes. As with all events, they take time to preapre and set-up though alas, they must come to an end. 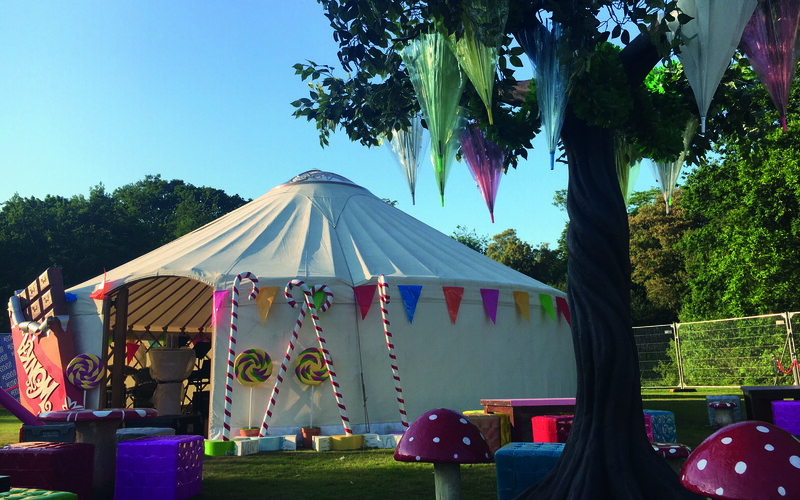 On Sunday we packed away the props, decorations and the Yurt was dismantled…were we event there or was it a ‘world of pure imagination’? For further information or if you have any events that require support with design or decoration then get in touch, alternatively check out our instagram.